It’s snowing! So beautiful. You never have snow, in Rome. Well, sometimes you do. Every twenty years or so. White carpet, muffling the steps of the many people walking the streets empty of cars and buses and motorcycles. So unusual. Cheers of adult children, wobbling snow-men by inexperienced hands. Monday morning. Ice paving roadways and sidewalks. No buses around, cars skating like crazy. Motorcycles? Impossible even to start them. And if you succeed, well, good luck! People are mumbling and cursing the mayor. It’s always the mayor’s fault. “The government should have provided more funds for the salt” says one. It’s always the government’s fault. Pray God next year it won’t snow. Winter’s over. In theory, at least. Pouring rain. One day after the other. And cold. Not even in winter was it so cold. Will the sun come out, one of these days? I know what will happen: we are wearing a winter coat today; we’ll need a bathing suit tomorrow. No more middle seasons. Yet, blossoms are blooming. No, they are not cherries. We are not in Washington D.C. Pretty, pink flowers of some other tree. Judas tree, we call it. How sad to give a tree such a name. Macabre. What do pretty, pink flowers have to do with a hanged man? Strange people, Italians, sometimes. I’m sure the sun will be out tomorrow. Let me get out my t-shirts and sandals. It’ll be very hot, tomorrow. Best time to be in town. No traffic jams, no horns blowing, no crazy workers yelling at people on a messy bus line because they’re late. The bus already bursting, yet they want to board. While in Rome, don’t do as the Romans do. Stroll Via del Corso, the Spanish Steps or some little alley whose name you don’t know. You’ll certainly mingle, such a multicultural picture of tourists in their different colors. What color are you? The sun is so blaring it is difficult to make out any color. Some shades, maybe, red, and orange and yellow. Madonna, it’s hot! At lunch time especially. Shades of colors, yet no shaded shelter. Water running in fountains. Fontana di Trevi resounds of its waterfalls, but you are no Anita Ekberg. Something to drink; and to eat, or you’ll starve. Expensive panini, water like vintage champagne. Supermarkets are closed. A mistake to be here on the 15th of August: Ferragosto, we call it. Remember that, next year, while vacationing in Greece. All seasons in one season only. So nice, this weather. Lucky you, it’s still summer last days of September. You can go to the beach, and swim, and dry in the sun. Yet it’s pleasantly warm, not as hot as in August. I’ll never forget that day, Ferragosto, last year. People have dinner in their gardens and terraces, even last days of October, a light sweater on their shoulders, still darkly tanned. Small moths flying in the sweet light of the lamp hanging over the table, now gently dancing in the mild blow of the wind. Ponentino, it’s called, from ponente, the West, where the sun goes to sleep. A few little drops. The wind stronger. Raining, oh, no! And so cold. I told you: no more middle seasons. Let’s run into the house! Get the food! The pasta is soaked! And now what? Some bread and cheese, some salami. Polenta? Oh, please, don’t be silly. Polenta is good when it’s frrezing, when the snow is falling, up in the North, in Veneto, maybe. The snow, in Rome, is so rare. Making the city so beautiful. Magic. Pray God it will snow, this winter. AMC was born in Sassari, Sardinia, and moved to Rome when she was 7. 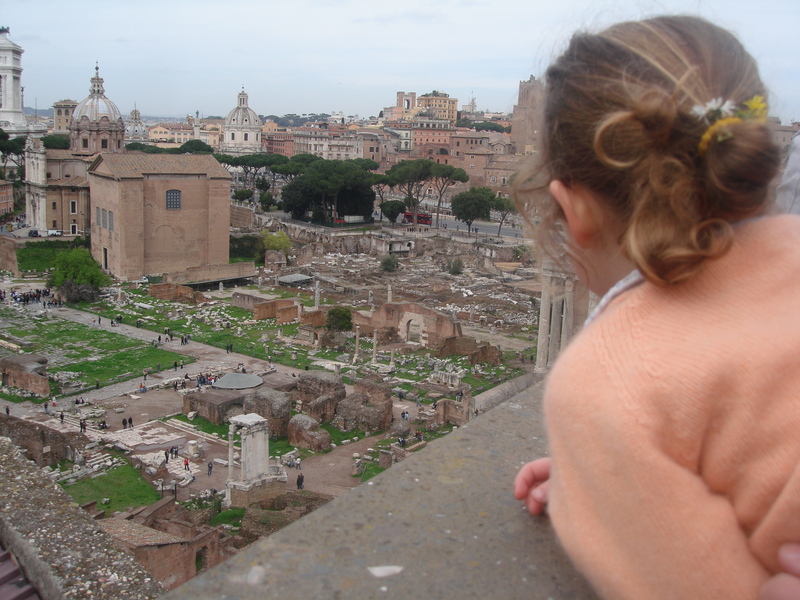 She has lived in NYC and London and currently teaches cultural anthropology in Rome. This entry was posted on June 11, 2013 by frankmattermag in essay, italian and tagged photo by nicholas benson.